ecstasy as in the self-hating fatique"
There's a strange sense of separatism when one rides in a handicapped van. Although the trip to exhibits was as a passenger in the limo of accessible vans; I still viewed the highway from a removed vantage point. Perhaps it was the height of the seats, the sense of riding into and out of the vehicle, or the mere fact that I hadn't driven a car in over seven years. Whatever it was it did not feel good! A buzz went around the Sea Cliff artists' community when a non-obtrusive sign went up on a store front window announcing the opening of a contemporary gallery! 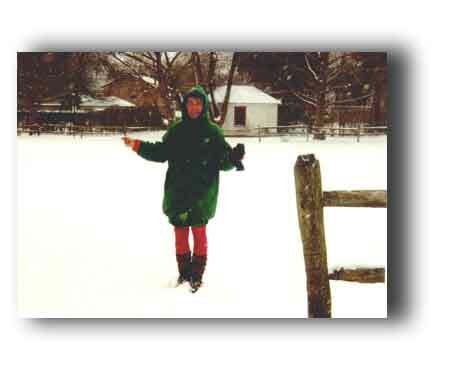 Nancy Driscoll; a former employee at the Paula Cooper Gallery in Soho, thought our Village a natural for cutting edge work and sales. 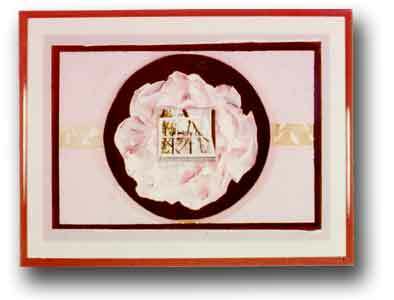 She went to many artists' homes and studios and was astounded by the numbers as well as the quality. Four collage/print pieces from the halo serieswould be in the December Angels Exhibit. 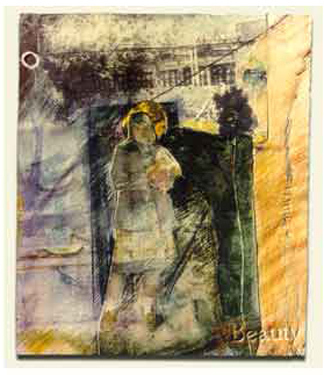 Beauty (1992) is one of them. In addition to the art there were seminars, videos and readings. Our Village was vibrantly cultural again. The relationship with Bill was torturous in the lack of commitment and honesty on his part. I stayed away from the restaurant unless invited. When we were together it was usually for a late dinner at some eating place other than his. I began to drink a lot of vodka. It didn't put the weight on and gave me less of an appetite. I was maintaining a size 6 and liked the way my clothes fit. Began to feel vain about my figure and age; he was twelve years younger and kept his body fit. A friend of his, Linda Georgian, was coming up from Florida to see publishing agents. Her professional handle was 'Psychic To The Stars.' Infomercials with Dionne Warwick attested to that. She was invited to stay with me! There was quite a snow storm and despite my fears I drove her to Jack La Lane's gym. She gave me a guest pass...my first time at such a place. Linda was in great shape and she had that sophisticated glamorous Hollywood quality. Not my style at all; tried to fit in anyway. For Bill's sake; or my sake through his eyes. A couple of weeks later she came up for another stay. This time over nighting at the inn in East Norwich. I chauffeured her around again. Can't remember if she was on Howard Stern the first or second visit. Whatever art work I accomplished that winter is lost both mentally and physically. With the advent of Spring, the exploding garden brought a burst of energy and love. Bill and I had a huge fight on Easter morning. I went to his apartment over the restaurant after church and found him with his other girlfriend. After tears, I told him to make up his mind. He did and with hindsight, to my misfortune, he decided on me! Of course at the time I was elated and our lives became entwined in a bliss unlike any either one of us had known. We went to florists and bought plants for me to adorn the grounds around the restaurant. We worked on ideas for expanding into the third building in the shopping center. 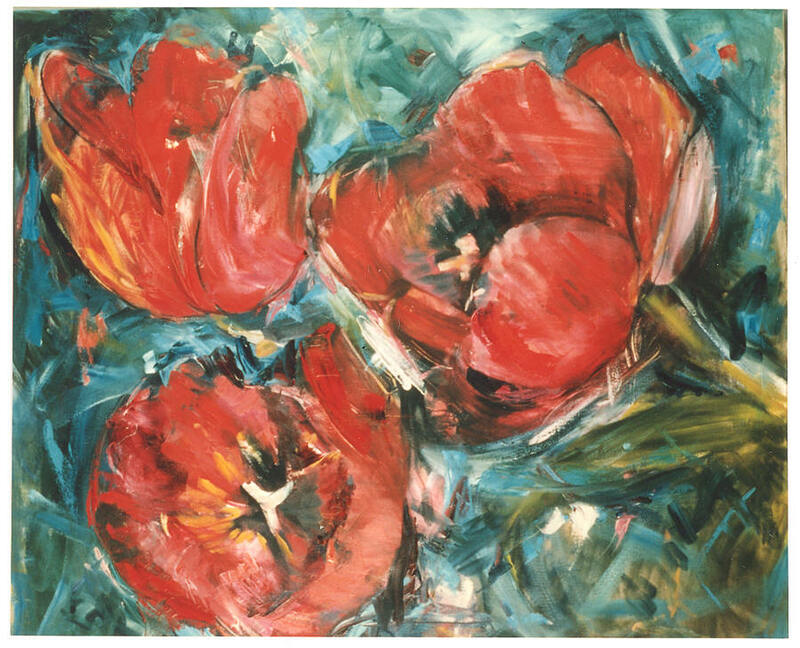 I painted 3 Red Tulips (1993). We went into the city to clubs (such as The Limelight) and to dine. The oils took on the quality of bas relief's. I smacked paint on with palette knives and thick paints, abandoning peaceful tonalities in favor of raw energy. Music, candles and sleepless nights in my studio. Teaching ended, all I had to do was hand in the student's grades. On May 19th I drove to Pearl Paint to exchange some resins for watercolors. On the way back I stopped in at Victoria's Secret for bras. For the first time I actually tried them on in the dressing room. I bought slim black pants, a white blouse and earrings. Shopping at a mall in the afternoon...another first. The winding road home took me past the horse farm.